1. Use rich and complex language when interacting with children. Use descriptive words such as “proud”, “forgetful” and “translucent” in everyday language and sentences, and the children will pick up the meaning of the word in its context – if not the first time, then the second or the third. 2. Encourage the children to use complex language and sentence structure by modeling words for the children to hear and say. Speak to them, as you would want them to speak back to you. Encourage them to express how they are feeling. 3. Read to small groups at story times. Make sure the children are comfortable. Show the cover of the book you will read and introduce the characters. Tell a little bit about the story. Hold the book so that the children can see the pictures. Make faces and change your voice to bring the characters to life. Stop and talk about what the pictures show and what might happen next. 4. Read fiction and nonfiction books aloud daily, a little beyond what you think the children can understand. Encourage them to ask questions, to discuss that they have heard and seen in the pictures, and to pretend to read the stories themselves. 5. Read to one or two children at a time when they make a request or when you want to share a book that's just right for a particular child. Use these read-aloud sessions to encourage children to talk about the story and the characters and to share their own ideas. 6. Provide props and costumes so that stories can be acted out. Have a box full of hats and scarves and bits and pieces, so that the children can create their concept of the characters. 7. Encourage empathy and extend imagination by asking the children how they think the character is feeling. Have them change the ending of the story, or tell what they think might happen after the story has ended. 8. Encourage children’s questions, and don’t necessarily answer immediately. Challenge them to think by giving part of an answer, and letting them make a connection. If they discover their own “answer” with a little bit of prodding, they will remember it longer. This also encourages self-confidence in their own ability to solve problems and reach conclusions. 9. Provide opportunities to arouse curiosity about their surroundings and the world. Offer opportunities to experience and discover things beyond their everyday environment. Play different kinds of music, for example ethnic, classical, rock, and not just “children’s” music. Have available paints to mix, seed to plant, and of course reading materials of many kinds. 10. Try to relate the “themes” that you present to the children with what they have an interest in at the time. You could have 3 or 4 themes going at once, depending on the level of fascination. Personal discovery is a powerful motivator to remember. 11. Variety in our surroundings arouses interest – rotate toys, activities and “centers”. Leave things available long enough for interest to wane a little, them bring them out again in a few weeks. New learnings will be added, I guarantee. 12. Field trips add amazing dimensions to interest, learning, and motivation. Make our world AUTHENTIC rather than “virtual”. Read the book, then visit the scene, then read the book again. WOW! 13. It is so important to demonstrate and model the mechanics of reading and experiencing books. Show how to hold it, to turn the pages, to recognize the beginning and the end. Point out punctuation marks, word breaks, paragraph breaks, different kinds of print, and different kinds of reading materials. Name the author and the illustrator, explain their roles. 14. Surround the children with print, letters and words besides books. Label objects, post the alphabet, play lots of matching and categorizing games. 15. Have many touchable, hands-on letters, words and print available. 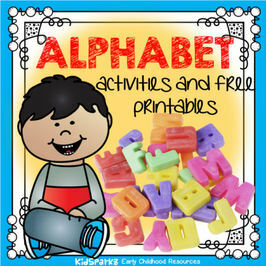 Alphabet puzzles, magnetic letters, stencils. Write letters in the air, on your knee, in sand trays, in finger-paint. Have wring materials (crayons, markers etc) available all the time. 16. Draw children’s attention to the sounds of the letters (phonemic awareness), and how they sound when they are part of a word or a sentence. This is a very important skill to develop. When the shape of a letter is introduced, associate it with it’s sound. 17. Read many books that focus on the sounds of words and letters, such as Dr Seuss, Chicka Chicka Boom Boom, nursery rhymes etc. Hesitate when saying the rhyming word, so the children can fill it in. 18. Play lots of rhyming games, such as “clap when you hear two words that rhyme”, or ask if two particular words rhyme. Chant them. Clap or stamp syllables of words, especially names. Count the syllables. Count the words. Exaggerate the sounds. 19. When indicating the first sounds of words, say it as a short sound. For example, say “de” quickly instead of “dar”. 20. Write down the children’s “words” as much as possible. Descriptions of pictures, what they did last night, a fantasy story, everything. Let them see you write it. Tell why you are leaving a space, or putting a dot. Point to each word and read it back to them, and let them read it with you. 21. Learn about your library's services for young children. Sometimes librarians can visit childcare programs to discuss books and ideas. Borrowing from the library is a great way to expand book access. Order ahead online. 23. Encourage children to develop the small muscles used for writing. They can cut, paste, draw, paint, thread beads on a lace, roll play dough, connect small blocks, use a keyboard, play a drum, spread peanut butter on a cracker.